The artist loved to travel along the Volga. Volga for Levitan has become like a heroine. On his canvases he often displayed landscapes that touched this mighty river. And this time, when the artist was in his favorite place Ples on the Volga, he wanted to write this picture. This is a very piercing chord, writing this canvas. Because the picture itself is contradictory. 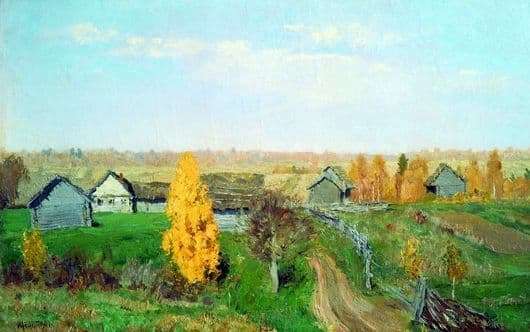 On the one hand, Levitan depicted a feast of nature, a bright autumn short-term pore, on the other – the ordinary life of a simple Russian village. The picture shows the mowed peasant huts, driving through the road, yellowing the forest. In the depths of the picture calm colors. Here the artist displayed the greatness of this vast space. And a calm expectation that cold and rainy days are coming soon. The picture shows the cyclical nature of life. The village stands in the midst of green fields. Around the sunlight, although the heat from it is no longer there. A slender birch stands to the left with its crown of yellowed leaves. It is a bright spot in relation to other trees that have already thrown off their leaves and they are darkened, as if waiting for winter to hibernate before the spring awakening. And along the crooked houses, a country road stretches, which seems to freeze due to a dilapidated fence, which is hooked on an extreme hut, and then appears between the fields and is lost somewhere on the horizon. The usual everyday picture. The master once again emphasized that life is a natural course of events. And that summer is replaced by autumn, etc. That is, it is a continuous cycle of the life of nature. The artist, who adored everyday motives, all the time developed this lyrical theme. And the teacher who inspired Levitan to paint landscapes was the remarkable artist AK Savrasov.